Early morning flooding hit the Boone area Friday when roadways became inundated with flood waters. Early morning commuters found roadways blocked with rushing waters. Emergency personnel were scrambling to direct traffic around affected areas. In addition to the downpour, a water main broke in front of Hardees and the Holmes Convocation Center, adding more water to the rainfall that was pounding the roads and sidewalks. 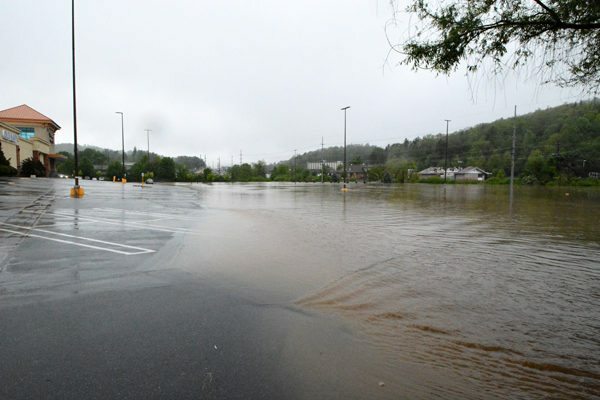 According to the National Weather Service, 1.5 inches of rain had already fallen in Boone this morning and parts of Watauga County have had five inches of rain in the last 24 hours. Unfortunately for the rain-soaked High Country, the forecast does not get any better through the rest of the day with rain and thunderstorms continuing with heavy downpours at times. These pictures are from 7:30 a.m. on the Blowing Rock Road near Hardees and the Boone Mall area.